One of the first advertising campaigns I ran was my own bid for junior class senator at Columbine High School back in the Dark Ages. I’m not sure whether the buttons, posters or personal appearances did the trick. But, remarkably, despite the pathetic slogan: “Put the Luck of the Irish in Senate. Vote Kathy O’Brien,” I won. The experience led not to a love of politics but for the intoxicating ability to influence public opinion through promotion. Although the budget for my high school senatorial campaign was minimal, advertising paid off…as it always does. Sell a few more units of your product. Instead of casually answering questions about your occupation, take a genuine interest in the people you meet. And look for opportunities to mention how you might be able to help them achieve their professional goals. Give clients two business cards so they can share one with a friend. Place your business name and phone number in a free online directory like Yelp or Google Places. Post a promotion on Facebook, LinkedIn or Twitter. Instead of spreading advertising efforts too thin, promote just one of your products. By focusing on a single strategy, you will be able to effectively measure the effectiveness of your campaign. Reward employees for superior customer service. Let your clients know about your commitment to meeting their needs. Join an active referral group like BRG, BNI or I Take the Lead. These organizations encourage lead generation among their members. Run a copy of your business card in the local newspaper or phone directory. Test and measure before upping your ad budget. Experiment with Pay Per Click (PPC) to improve website search engine ranking. Invest in Facebook PPC, display ads on LinkedIn and contests on Twitter. Having access to a healthy ad budget will enable you to try several types of advertising so you can test and measure the effectiveness of each. Run a customer service contest to reward clients who post reviews and take surveys. Clients who care enough to write reviews should be encouraged. Seek out a leadership role in your local chamber of commerce or professional organization. While this will require a considerable investment of time, it is well worth the effort because you will emerge as a leader in your field. Increase your current Internet campaign to increase visibility and gain social media friends, fans or followers. Buy promotional items featuring your company logo, phone number, website address and slogan. Encourage employees to distribute the items. Google is constantly changing algorithms to rely heavily on social interactivity. And few business professionals have the time or desire to comment to blog posts, comment on Facebook or tweet. So, if you haven’t hired a professional agency to manage your social media yet, do so today. 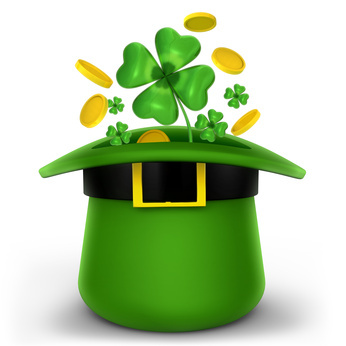 In fact, call Kathy O’Brien Bowling at Mountain Marketing Group and put the luck of the Irish in your campaigns!